US - Boston Globe stories about the U.S.
BELLINGHAM, Wash. - Travelers of all ages rushed with their stuffed backpacks to the top deck of the M/V Malaspina to secure a camping space in the open air. For years I had gazed at a clipping on my bulletin board describing adventurers pitching tents on the Alaska Marine Highway ferries. Now, my husband and I were on a three-day voyage along the Inside Passage from Bellingham to Juneau, Alaska. Since 1951, eleven ferries - the largest of which accommodates 499 passengers - have traveled 3,500 miles of routes along the marine highway. These comfortable ships venture as far south as Bellingham and as far north as Skagway, Alaska, with port stops in between. For many Alaskans, the ferries are a primary source of transportation between small, hard-to-reach coastal towns. “You’ll need this,’’ the pickup driver said as he tossed me a giant roll of duct tape, explaining that once the ferry got going, the wind would kick up, threatening to blow tents overboard. I watched as passengers affixed tent lines to the rough cement with layers of tape and heard horror stories like the one about the guy who had gone below to use the bathroom at midnight and returned in his boxer shorts to find his tent and gear in the sea. We secured our backpacking tent and went to return the tape. The man shook his head. “Pass it on,’’ he said. Generosity was infectious as we cruised along British Columbia’s forested shore. Passengers in the solarium shared pretzels, hummus, and cider (alcohol was forbidden on outer decks). Yoga mats appeared; guitars inspired a jam session. Initially, I worried about seasickness, but the Malaspina sailed smoothly into the sunset. We walked downstairs to check the cafeteria with its tempting smells of salmon and steak, and explored a bustling bar, small movie theater, and glass-walled observation lounge. On our first night we worried that noise might keep us awake. But the ferry’s motor rumbled steadily, lulling us to sleep in our down bags on inflatable pads. We got up at dawn to commune with a scattering of early-risers toting Canons and Nikons. I walked down to the cafeteria, hatted and mittened against the stiff breeze, for a quarter’s worth of hot water to add to my mug of instant coffee. In a protected outdoor alcove, I watched the sun rise over a bucolic coastal town whose residents waved from their balconies. The pickup driver joined us, jerking his chin at bald eagles perched in a tree. “Dumpster ducks,’’ he sneered at the raptors, so common in his part of the world. Ferry travel inspires an instant camaraderie born of wind and water and periodic port stops. In Petersburg, the captain announced a three-hour layover and passengers headed toward the town’s main drag to share pitchers of Northwest microbrew. “Want to tape it down?’’ I said. He grunted and ducked inside. We crawled into our tent and fell asleep to the ferry’s purr. At 3 a.m., gusting winds buffeted the tents. Those sleeping outside moved their bags into the solarium or onto the cushioned seats in the observation lounge. I slumbered on. Melissa Hart can be reached at melissah@uoregon.edu. 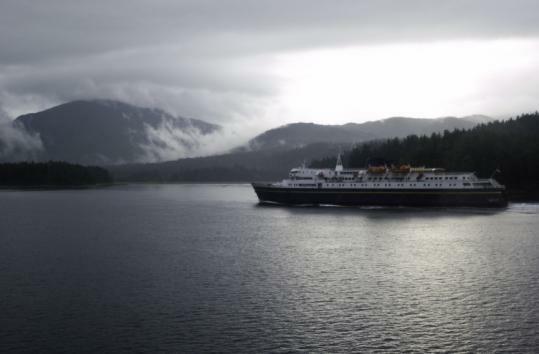 From May to September the Alaska Marine Highway ferry leaves from Bellingham, Wash., every Friday at 6 p.m. and arrives in Juneau, Alaska, on Monday morning with several port stops along the way. Top deck $326, cabins $308-$533. Bicycles/inflatable kayaks/cars for additional cost. For reservations and maps, visit www.dot.state.ak.us/amhs/index.html.